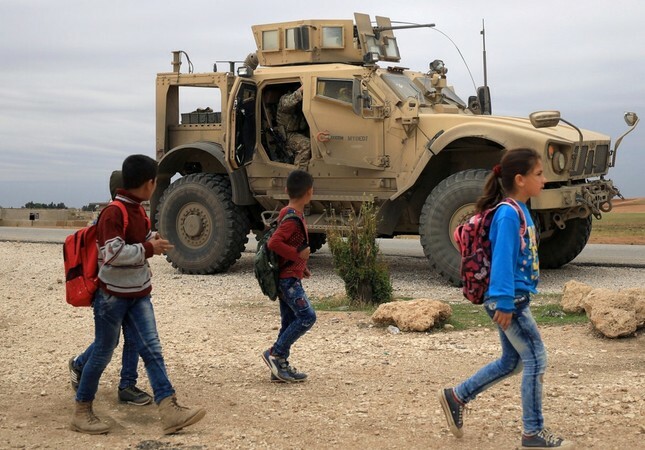 Syrian schoolchildren walk by as U.S. troops patrol an area near the Turkish border in Hasakah, Syria, Nov. 4, 2018. Ankara has accelerated diplomatic efforts with international actors to carve out a road map following the U.S. withdrawal from Syria. The efforts in the upcoming days would particularly focus on Turkey's plan to establish a safe zone near the Syrian border to eradicate national security threats. A Turkish delegation, headed by Deputy Foreign Minister Sedat Önal, is currently paying a visit to Washington. The delegation will meet U.S. Undersecretary of State for Political Affairs David Hale on Tuesday. Part of the high-level joint working groups, the delegations will mainly focus on the U.S. withdrawal from Syria and measures that would prevent a power vacuum in a region that is already grappling with instability. The U.S. decision to fully withdraw its 2,000 troops from Syria was announced by U.S. President Donald Trump in December. The development was welcomed by Ankara on the condition that the pullout should not empower the PKK-affiliated People's Protection Units (YPG). Considering the terror threats against Turkey coming from war-torn Syria, Ankara and Washington have been discussing a plan to set up a safe zone along Turkey's border. High-level officials in Ankara have stated that the safe zone should be free from YPG terrorists and the zone should be under Turkey's control. The delegations are set to discuss the safe zone plan in detail, with expectations of concrete results. Since 2012, Turkey has suggested that a 30 to 40-kilometer safe zone could be established between the northern Syrian towns of Jarablus and al-Rai. However, the plan did not come to fruition at the time due to the indifferent manner of Ankara's partners. In the meeting of the working group for Syria, the delegations are also expected to discuss the implementation of the Manbij deal reached by the U.S. and Turkey, aimed at the withdrawal of the YPG from the region. Ankara has long criticized the sluggish process, calling on the U.S. to implement the deal without losing any more time. Turkey has stressed that the presence of the YPG, with heavy arms provided by the U.S., is a grave security threat to the country. It welcomed the U.S. decision to withdraw from Syria and highlighted that in the process ahead the two countries need to increase cooperation to ensure the U.S. move will not bequeath more problems. Accordingly, Turkey underscores that weapons given to the terrorists, under the pretext of the fight against Daesh, should be collected. The issue is also expected to be discussed during the meetings. Following the talks, Foreign Minister Mevlüt Çavuşoğlu is expected to visit the U.S. tomorrow, to attend a foreign ministers' meeting of the anti-Daesh coalition. The meeting will be attended by the foreign ministers of the 79 member countries. Accordingly, in the meeting, the steps to prevent a comeback by Daesh and enable security in the region will be top the agenda. Çavuşoğlu is expected to hold bilateral talks as well on the sidelines of the meeting. While the diplomatic traffic between Turkish and U.S. officials keep increasing, the Trump administration has continued to implement the withdrawal plan on the ground. The U.S. president said in an interview Sunday that some troops withdrawing from Syria will relocate to a U.S. base in Iraq, where they will "keep watching" the region, in particular, Iran. Trump defended his decision to pull back U.S. military engagement in Syria and Afghanistan, saying it was in line with campaign promises. "I don't like endless wars," Trump said, repeating complaints about the financial and human costs of military operations. He added that Daesh in Syria is "almost knocked out" and promised an announcement soon saying it is 100 percent wiped out. Speaking on the U.S. withdrawal plan, President Recep Tayyip Erdoğan said he hoped Washington would pull its troops out of Syria soon. If not, Ankara would take action to avert the possible terror threat posed by YPG terrorists, he told TRT World on Sunday. "Whenever we see any sign of a threat, we will do whatever is needed," he said. Erdoğan also showed the negotiated "security zone" on the map, during the broadcast. He said it would stretch from Jarablus in northern Syria to the Iraqi border. He urged the U.S, to hand over the zone's security duties to Turkish troops. Late January, the president said Ankara expects to form the safe zone within a few months and only Ankara has the power to do so. Speaking after the Justice and Development Party's (AK Party) group meeting, Presidential Spokesperson İbrahim Kalın said Turkey is capable of bringing peace to the rest of northern Syria via a safe zone as it did in the liberated towns of northwestern Syria, including Jarablus, Afrin, Azaz and al-Bab. Furthermore, Erdoğan and his Russian counterpart Vladimir Putin will meet on Feb. 14 in Russia's coastal city of Sochi to discuss Syria. Turkey, Russia and Iran will hold the second Syria summit in Sochi in order to contribute to the efforts for a resolution in Syria. Turkey and Russia, together with Iran, are the guarantor countries of the Astana talks that have been held parallel to the U.N.-backed Geneva talks. Previously, Russian Special Presidential Envoy for Syria Alexander Lavrentyev and Deputy Foreign Minister Sergey Vershinin discussed with Turkish officials in Ankara the formation of Syria's constitutional committee, the Russian Foreign Ministry said in a statement Friday. "An exchange of views took place on the current situation in Syria and measures to advance the political process, including the task to launch the constitutional committee as soon as possible, [it] is an important stage in resolving the Syrian crisis," it added. Turkey will enhance dialogue with actors on the ground in Syria and continue to exert efforts so the ongoing crisis finds a peaceful a resolution.